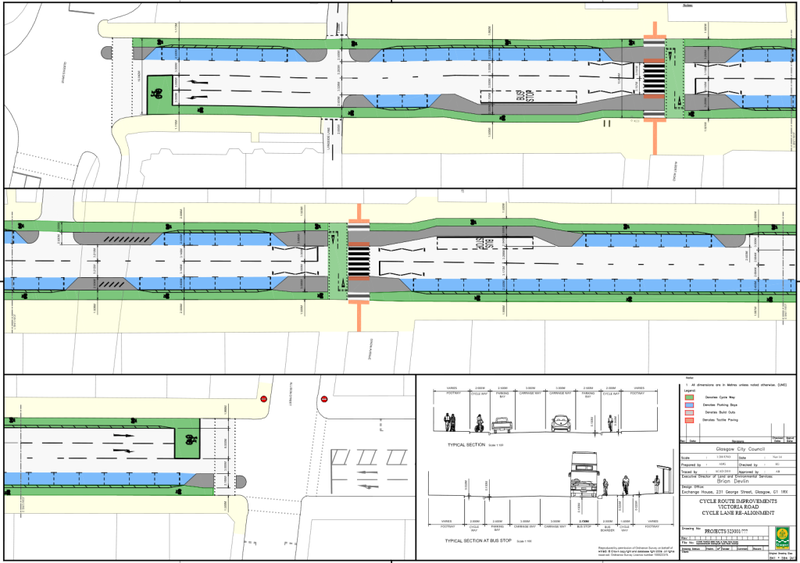 Glasgow City Council has released two draft designs for drastic improvements to the southern end of Victoria Road (with the difference being a choice between a cycle lane on either side, or a single dual-direction cycle lane on the western side). They’re comfortably the best street layouts for pedestrians and cyclists that GCC has produced in recent memory and, with a few tweaks, could even approach the heady heights of As Good As The Dutch. There’s a consultation this Thursday 26 Nov 2015, between 15-1900 at Calder St baths (link), which it would be great if you could get to. In the meantime I’ll waltz through some highlights. Victoria Road, between its southern end meeting with Queens Drive (ie next to Queens Park) up to Allison St (the first major road that crosses Victoria Road to the north). 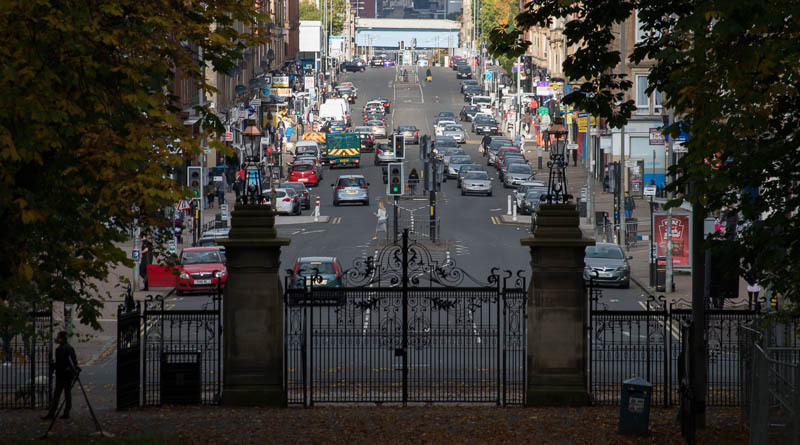 Victoria Road is one of the three main arteries in to the city centre (with Eglington St and Cathcart Rd being the other two), as well as a reasonably busy shopping street in its own right. 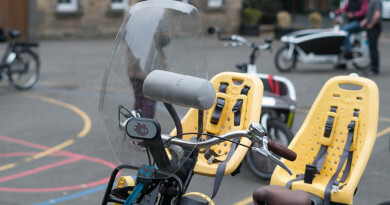 It is heavily used by buses, but also already gets a decent amount of cycle traffic (sometimes up to ten folk waiting at traffic lights; an unheard of number in Glasgow). Although it’s disappointing that more of Victoria Road isn’t being upgraded, I can see some logic in tackling it in small chunks. It is a busy street, so there will inevitably be disruption during the work. This first stretch shouldn’t take too long to sort out, and being able to quickly demonstrate the benefits to residents and businesses of the changes should make getting local buy-in to an upgrade of the rest of the street more straightforward. In particular, it should quickly shut out the tired concern that reducing the amount of tarmac available for private cars damages local businesses. There are many studies that show this is not the case, but I have no doubt we’ll hear it at some point. One cycle lane or two? Only one option makes sense to me, and that’s having two lanes, one on each side of the road. The only reason to have a dual-direction cycle lane is if the street is only one-direction for motorised traffic, or if it’s overly challenging for cyclists for reach the far side of a road (eg on a dual carriageway, where you’d ideally have dual-direction cycle lanes on either side). 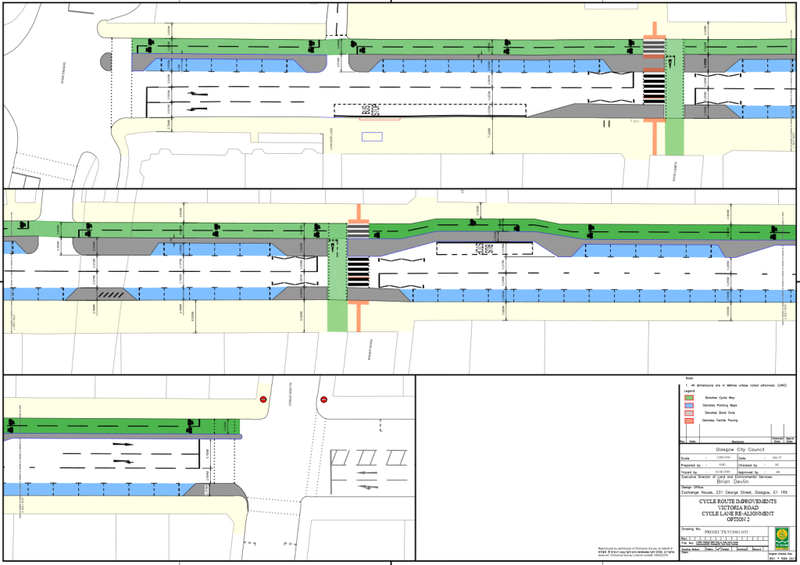 If there was no protection on the eastern side (the bottom of the diagrams above) then folk heading south are going to have to wait in the centre of four lanes of traffic at the Allison St junction before crossing into the lane. 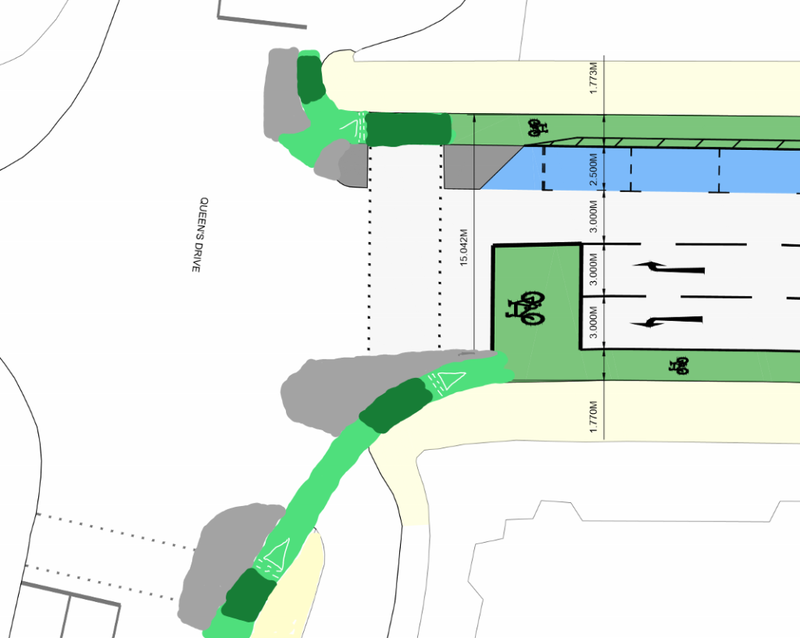 The bulk of cyclists will then turn left into Queen’s drive at the southernmost end of the Victoria Rd, so they’ll have to wait again to cross back over and continue on their way. At a relatively gentle pace it takes me 40 seconds to cycle the entire length of the scheme using the road. No-one is going to wait to turn right to reach the cycle lane, only to have to wait to turn left a few hundred metres later. They’ll just carry on down the main carriageway. Two lanes makes things easier for pedestrians and drivers too, as you won’t have a cyclists unexpectedly traveling in the “wrong” direction on the western side of the road. What are the good bits of the design? For illustration, here’s a big picture of a bit in the middle. Segregated cycleways, seperated from moving traffic by either raised paving or parked cars. Cycleways on the inside of parked cars, rather than positioned where drivers opening their doors can knock you under a bus. Floating bus stops (although the shelter needs to be moved onto the island, rather than obstructing the pavement). Taking space away from private cars and giving it back to pedestrians (and cyclists). Replacing push button pedestrian crossings with zebra crossings, which will reduce delays to people wanting to cross the road. The very adventurous combination pedestrian/cycle crossing, which will be a first for Glasgow (and possibly Scotland). And the less good bits? a 1.5m width single-direction lane is the absolute minimum, only meant for use when there is no way a wider lane would fit. This isn’t the case here. My bike is around a meter wide and I don’t go particularly fast. Which will be a shame for everyone stuck behind me, unable to overtake because the lane is too narrow. There’s no indication of how wide the hazard markings are between the inside doors of parked cars and the cycleway. If a passenger is able to intrude on the lane with a carelessly opened door, then they need to be wider (without reducing the width of the remaining cyclelane either). I strongly suspect we’ll need some bollards or other obstructions to remind particularly dozy/selfish drivers that they can’t use the cycleway as a parking space. As mentioned above, the bus shelter should be on the island rather than the pavement. Darker green indicates a raised ramp, so the cycleway would be level with the surrounding pavement. Pedestrians have priority crossing. This makes it easier for folk on foot to cross into the park (particularly with prams and small children), makes the junction quicker for cyclists, and avoids the dangers of cars and buses left-hooking cyclists round the junction. Remind me when I could provide feedback? This Thursday 26 Nov 2015, between 15-1700 at Calder St baths. More information has been put up by GoBike here.